I started to learn the Ukrainian alphabet today! Once I received an invitation to serve in Ukraine, the Peace Corps sent over “Survival Ukrainian”, a short packet of 20 language lessons with accompanying .mp3 files. The lessons start with the alphabet and then continue with useful phrases dealing with everything from greetings to emergencies to the post-office. The lessons do not discuss any grammatical topics as they are only designed to help Volunteers survive in the first few weeks of the three month pre-service language program held in Ukraine at the beginning of service. 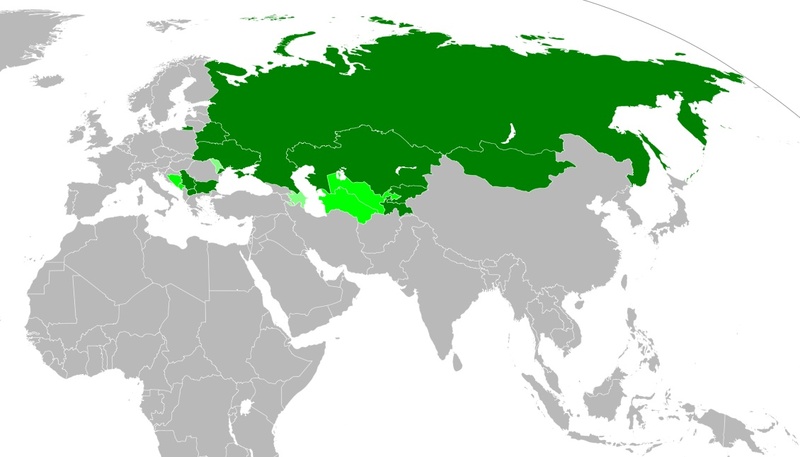 This map shows the countries in the world that use the Cyrillic alphabet or its variations as the official script in dark green and as one of official in light green. I’ve learned that Ukrainian is a variation of the Cyrillic alphabet and belongs to the Slavic group of the Indo-European language family. It has been the official language of Ukraine since their independence from Russia in 1991. However, many citizens still speak Russian at home – especially in the urban southern and eastern regions. The alphabet consists of 33 letters with six vowels. Many of the letter sounds are similar to English but this does not make memorizing the alphabet easy. Many of the similar sounding letters use a character that looks identical to an English character but denotes a different sound. For example, the Ukrainian letter H looks identical to the English letter H but sounds like the English letter N. In addition, the Ukrainian letter P looks identical to the letter P but sounds like the English letter R. Whereas the Ukrainian letter that looks like a backwards R, sounds like the English letters JA. I also noticed that B sounds like v. This is the opposite of Spanish that V sounds like b. Languages can be very confusing!